Plus, a new confectionery cooking show, Sweets Made Simple made its debut on BBC2. Hosted by the sunny Miss Hope and the affable Mr Greenwood, it is really rather enjoyable telly. Plus the sweets do appear quite achievable, straightforward and, erm, simple*. And, with the remnants of Hurricane Bertha bringing cooler temperatures and rain of cats-dogs-and-goldfish variety, I finally feel its safe to switch the oven on again. The last few weeks, in the cloying, heady London temperatures, the oven has been out of bounds with salad and ice cream firmly on the menu. Thanks to Bertha, the quest to satisfy my sweet tooth can continue to march forth. This pud was inspired by a visit to The Green Man and French Horn, a French bistro in Covent Garden where I enjoyed an almost exact copy of this delectable dessert. 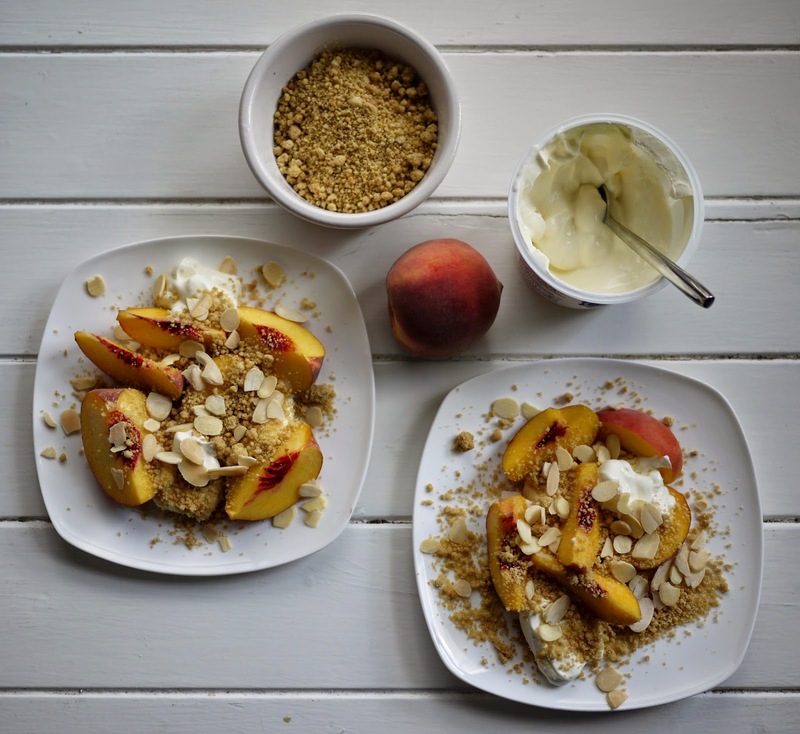 Perfectly ripe, juicy peaches, a few generous dollops of creme fraiche, a scattering of toasted almonds and crumble topping make this deconstructed pud a great summertime make-ahead recipe. *Fatal words. No doubt if I attempt their English Almond Butter Toffee, I'll end up with a burnt-beyond-redemption saucepan, boiling sugar on every surface within a one metre radius and the sugar thermometer dumped unceremoniously in the bin. 1. Firstly make the crumble: Preheat the oven to 180C/160C fan/350F/Gas Mark 4. Rub together the butter and flour until the mixture resembles breadcrumbs. Stir in the sugar and ground almonds. Spread the mixture out on a baking tray and bake until golden brown. Meanwhile dry-fry the almonds on a low heat, shaking the pan every thirty seconds or so, until toasted. 2. Slice the peaches into quarters and place onto the serving plates. 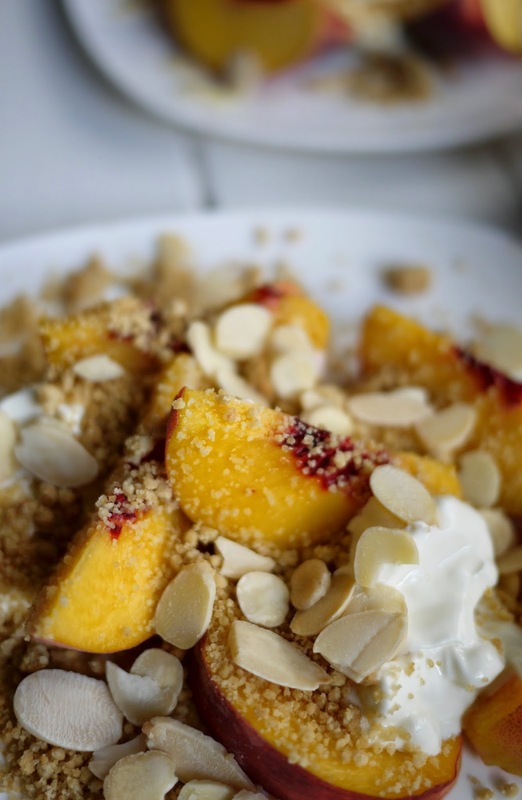 Divide the creme fraiche and honey between the plates and sprinkle over the crumble and toasted almonds. The first stage of this recipe can be made in advance and plated up when ready to eat with the peaches and creme fraiche. I love peaches in anything...but I don't like eating a peach. I may be weird (yes) but I think it's the fuzz puts me off. This looks a lovely light crumble dessert. Peaches and Cream -and- Honey, oh my goodness that sounds delightful. so beautiful... your photo's are just so tempting and moreish... such a simple but gorgeous desert! Thank you Dom- the light was very much in my favour when I made these! Gorgeous! We must be on the same brainwave as I made a peach-plantain cobbler last night. Your looks gorgeous, a must-try. Thank you KAren- I tend to bake solely with summer fruits from June-August! 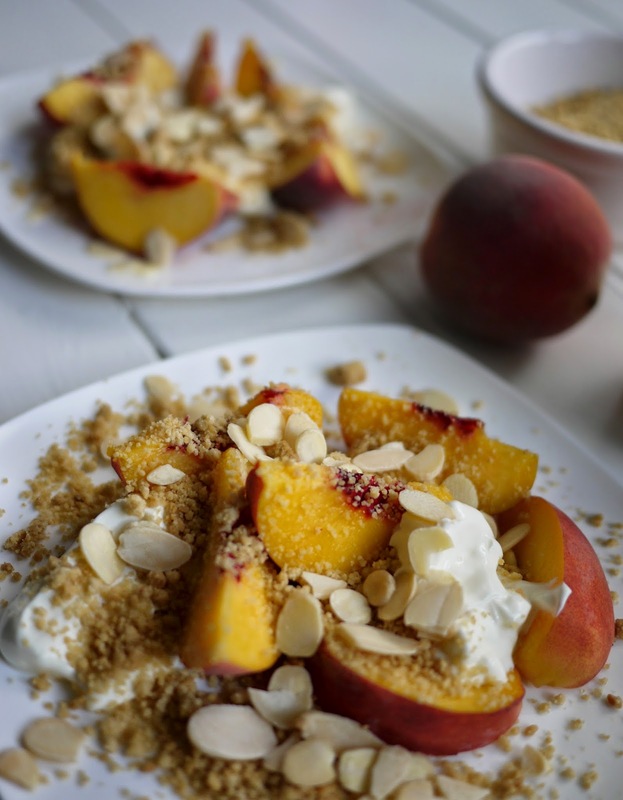 This looks gorgeous - I made a similar deconstructed crumble dessert with plums the other weekend, now I really want to try your peach version! Thank you Lucy- yes, I've a few plum recipes coming up!